For Jonathan's birthday, we went to Benihana with a group of friends. It was a good time, especially as we no longer have teppanyaki as often as we used to. 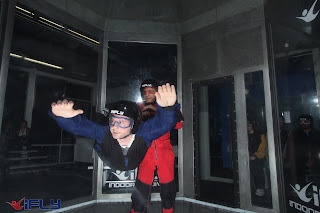 Another night, he and I did something else that was pretty cool... we did some indoor skydiving. It was a very different experience from regular skydiving (which I surprised Jonathan with for his 19th birthday, though we ended up going four months late), and quite a bit more difficult than I was expecting! (in the below wind tunnel pictures, I'm wearing yellow and Jonathan is wearing blue) I was really hoping that I'd find it fantastic, but I ended up struggling and didn't enjoy is as much as I had hoped. It's not even that much cheaper than regular skydiving, which sort of amazed me. After talking with some other people who have tried both types, it really seems that there are two main parts of skydiving that people really enjoy... one is the feeling of free-falling and the spinning and maneuvering in the air... the other prefers the jump from the plane, the view of the ground, and handling the parachute. 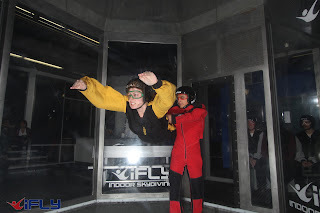 For folks who like the former, indoor skydiving would be great. For people who like the latter, the real thing is a better fit. And, I'm one of those in the second group. We went back to Florida for Christmas, which was a much shorter trip than Thanksgiving. We spent a couple of days on the west coast of the state, and Jonathan and his uncle enjoyed a bicycle trip on Christmas Eve which allowed the rest of us to enjoy having a destination holiday. We went out for Christmas Eve dinner, experienced a different church service, and walked on the beach of a state park on Christmas morning. It was a different way to spend the holiday, but it was fun. On the 27th we had Christmas at my mom's house, then we left to return to California. We had a quiet New Year's Eve, having dinner at our favorite Mediterranean restaurant, watching the movie New Year's Eve, and having champagne in our hot tub in the backyard.